The Granton works of the Edinburgh & Leith Corporations’ Gas Commissioners. 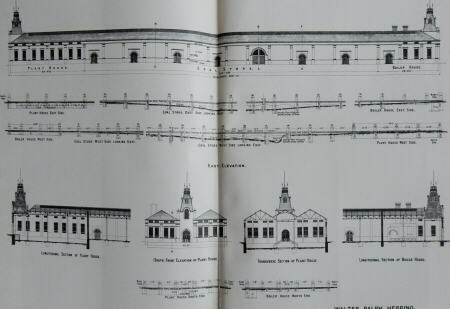 Their design, construction, & equipment with illustrations, plates, and details of costs. By the mid 1890s, the various gasworks of the Edinburgh area were stretched to breaking point. It was therefore decided to build a substantial new single-site gasworks, able to meet present demand and capable of future expansion. Set on the banks of the Forth, close to Granton harbour, the works were designed and built by the author and this is his own comprehensive account of the achievement. As with all gasworks, the architecture was a notable feature. The buildings made use of the latest materials and construction techniques, with handsome arched latticed-girder steel roofs and floors made of an early system of reinforced concrete, known as expanded-metal concrete or "Expamet". All this is described and illustrated at length together with the carbonizing plant, the regenerator furnaces and retorts, coal and coke handling plant, purifiers, meters, the great gasholder etc. Large 4to. xiii + (iii) + 284pp, 26 double-page or folding plates, 2 un-numbered maps and plans and many photo text ills. Publisher's cloth, a little stained and shaky.